Jason and Michael’s wedding day is nothing short of vibrant and it isn’t only due to the eye-popping hues of hot pinks and clover greens. Derek Halkett Photography fantastically captured the candid joy and celebration that permeated that special day in Burlington, Mass., for our two handsome grooms. With plenty of room to tear up the dance floor, close friends and family enjoyed a day filled with the light and warmth of love. Despite the impressive color coordination in every facet of the decor from the shoes and socks to the floral arrangements and the cake design, nothing is more astounding than the color and vibrance that these two grooms infuse into one another’s lives. 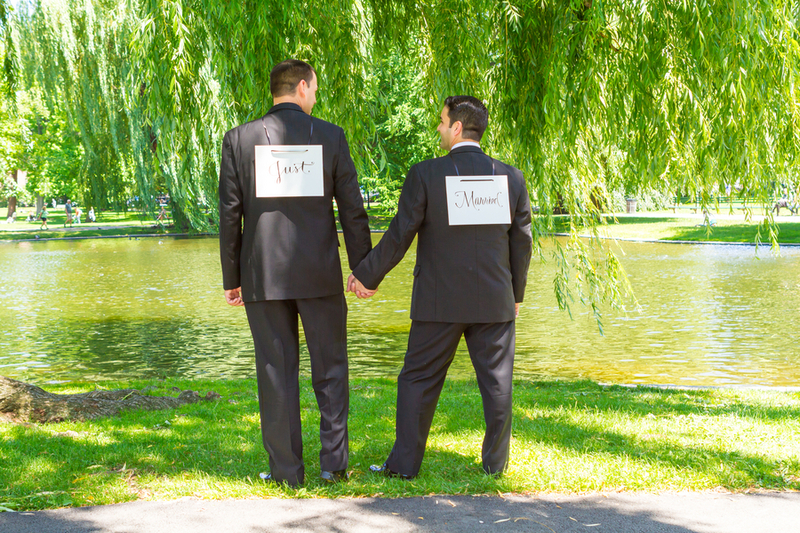 Jason and Michael’s saga of love begins when they first started dating way back in 1997 after meeting briefly a few years prior through a mutual employer. Together for 16 years before deciding to tie the knot, soul mates Jason and Michael have been lucky enough to grow and flourish by each other’s side. While celebrating the purchase of a summer home in Cape Cod, the happy couple began to talk about plans for making their union more formal, and they are both thrilled that they did. Jason and Michael chose to keep their ceremony beautifully and simply traditional, exchanging rings and selecting vows that resonated with them. “We incorporated our dog, Phineas, in the ceremony, since he could not witness the exchanging of vows of his two dads,” the hubbies tell us of their furry baby. The ladies in the wedding party looked fabulous in hot pink dresses and clover green shoes, incorporating roaring ’20s glam and coordinating their bright, bold look with the groomsmen’s socks (who doesn’t love crazy fun socks?!?). 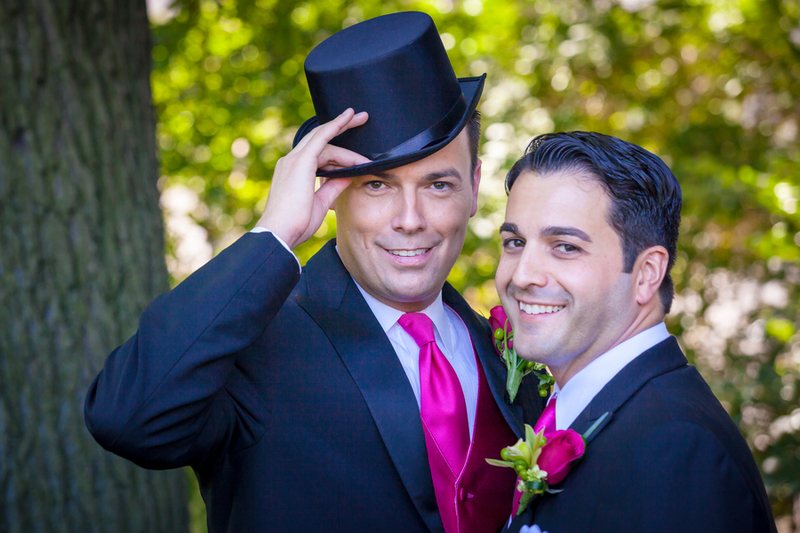 Our grooms looked dashing in their black tuxedos, adding a pop of color into their look with hot pink vests and ties. All the bold, vivacious colors were beautifully tied together by a gorgeous floral design consisting of green hydrangea, willow branches and hot pink roses that matched the girls’ dresses perfectly. To add some ambiance, votive candles, dim lighting and hot pink up-lighting created breathtaking splashes of color throughout the venue.